The nature of the coupling at the basal boundary is one of the major unresolved problems of glaciology. Ice, with a rheology defined by Glen's law (where the strain rate E = ktn, where k is a temperature dependent constant, t is shear stress and n has a value of between 3 and 4), can be regarded as a perfectly plastic solid with a yield strength of about 100 kPa. If the ice-bed interface is a strong interface, the average shear stress (given by pgh sin a; where pi is the density of ice, g the gravitational acceleration, h the ice thickness and a the surface slope) at the base of a glacier must have this latter value to drive the necessary flow. If, however, frictional interlocking at the ice-bed interface is weak, so that the frictional resistance mobilized at the interface is significantly less than 100 kPa, ice movement will be dominated by low stress décollement at the glacier sole, and there will be relatively little internal flow in the ice. Some modern ice streams flow continuously at shear stresses of as little as <15kPa (Whillans & Van der Veen, 1997), and reconstructions of former Pleistocene ice sheets also indicate flow under similarly low shear stresses (Mathews, 1974). Currently, ice-sheet models define the basal condition in a way that does not depend upon physical understanding of the processes at the boundary. It is generally derived as a fitted parameter. Consequently, confidence is low that models have the capacity to predict, rather than merely explain, behaviour that depends on basal processes, such as streaming or surging. 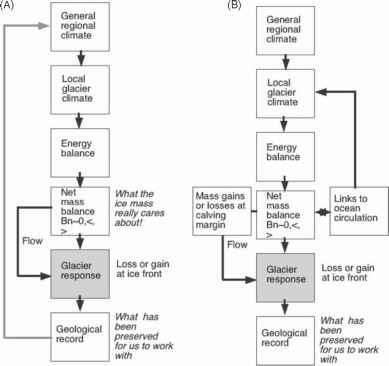 A central issue for ice-sheet glaciology therefore is whether there is strong or weak coupling at the ice-bed interface, and the processes that determine this. The parallel issue for glacial geology is how the nature of coupling is reflected in the erosional or depositional products of glaciation. The degree of coupling and the magnitude of traction are determined by two components, the solid interactions that take place between the glacier ice and its bed, and the water pressures that are determined by the nature of drainage. If drainage is efficient, water pressures will be drawn down strongly, effective pressures will be high, and basal friction will tend to be at a maximum (Fig. 2.1b). If drain-age is inefficient, the converse will apply. Alternatively, the system may be self-organized in a way that favours a particular outcome. The rest of this article is therefore concerned with processes at the basal boundary, and attempts to integrate modern glaciolog-ical evidence with the glacial geological and geomorphological evidence from the beds of former ice sheets. Prior to the past 25 yr, glaciologists had implicitly assumed that glaciers flowed over hard, lithified and impermeable beds. Thus, any décollement at the ice-bed interface must be by ice sliding over a rigid, rock surface. Weertman (1957) suggested that sliding at the ice-bed interface must be associated with an intervening thin water layer, which would preclude tangential friction, and that the basal drag must be generated through movement by plastic flow and pressure melting/regelation around obstacles on the bed. Much of this conceptual frame has been confirmed by direct field observation (e.g. Kamb & LaChapelle, 1964). However, Boulton et al. (1979) conducted direct stress experiments beneath a glacier that showed that debris embedded in basal ice contributed a large, tangential, component of the drag at the base of the glacier (recent experiments by Iverson et al. (2003) have produced similar results). In this setting, water from basal melting is assumed to flow in a thin layer between the ice and the bed until it is able to reach subglacial drainage channels (e.g. Rothlisberger, 1972; Weertman, 1972). In 1979, Boulton & Jones showed that soft, unlithified sediments beneath a modern glacier were undergoing shear deformation at such a rate that they accounted for a large proportion of the forward movement of a glacier. Fischer & Clarke (1997) observed that slip at an ice-sediment surface occurred during periods of high water pressure, whereas shear movement was concentrated in the sediments during periods of lower water pressure. Boulton (1974) had drawn attention to the potential for groundwater flow to influence the effective pressure at the ice-bed interface, and Boulton et al. (1993, 1995a, 1996) and Piotrowski (1997a,b) showed that a large proportion ofbasal meltwater could be discharged in permeable subglacial beds rather than being restricted to flow in a water layer or in channels at the ice-bed interface. This intergranular drainage is clearly a vital process in determining effective pressures, the threshold for deformation in unlithified subglacial sediments, and shifts in the location of décollement between the ice-bed interface and underlying sediments. These insights are the basis for our understanding of sedimentary processes at the ice-bed interface and nature of the basal boundary condition. 1 Rock beds. Basal ice, which may include sedimentary debris, is in direct contact with a hard, lithified rock surface. This is a common state in many glaciers in steep-sided mountain valleys, and has been observed on a number of occasions in artificial subglacial tunnels (e.g. Kamb & LaChapelle, 1964; Vivian & Bocquet, 1973). 2 Thin till on rock. Thin lenses or sheets of till (<10m thick) are frequently found on predominantly rock beds in valley glaciers and over large areas of the Precambrian Shields that formed the core areas of the North American and European ice sheets. 3 Thick unlithified sediment beds. Beds of this type occur around the margins of the North American and European pre-Cambrian Shields, and on many low lying coastal plains onto which high-latitude glaciers flow, such as in southern Iceland and western Alaska. Although we are currently only able to assess the nature of beds beneath the modern ice sheets of Greenland and Antarctica over a tiny proportion of their area, seismic surveys and drilling in the areas of a number of Antarctic ice streams have revealed an underlying soft bed (e.g. Alley et al., 1987a—Ice Stream B, West Antarctica; Smith, 1997a—Rutford Ice Stream, Antarctica). These ice streams flow at high velocities under driving stresses as low as 10kPa, and it is assumed that the soft bed, presumed to be till, is implicated in the fast flow process. The nature of these beds, and the mosaic of bed types that make up the whole bed of an ice sheet, almost certainly play a fundamental role in determining many large-scale dynamic aspects of ice-sheet behaviour. We now examine the role of the bed in relation to the key hydraulic processes which determine the effective pressure regime and the nature of the frictional coupling between glacier and bed.